College isn't about getting high scores. It's about having principles that you will always hold, even after you graduate. 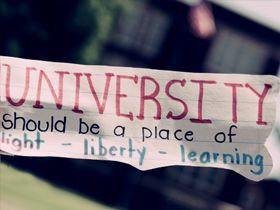 A university is just a group of buildings gathered around a library. The university's characteristic state may be summarized by the words of the lady who said, "I have enough money to last me the rest of my life, unless I buy something." It is simply untrue that all our institutions are evil,... that all politicians are mere opportunists, that all aspects of university life are corrupt. Having discovered an illness, it's not terribly useful to prescribe death as a cure.